Sen. Dan Patrick, on the right, and San Antonio Mayor Julián Castro debated immigration Tuesday in San Antonio. As they traded barbs during a televised debate on Tuesday night, Republican lieutenant governor candidate Dan Patrick and San Antonio Mayor Julián Castro covered a range of issues beyond the set topic of immigration policy, including the November general election and abortion rights. During the hour-long event in San Antonio, broadcast on the Spanish-language TV station Univision and moderated by Texas Tribune CEO and Editor-in-Chief Evan Smith, Patrick frequently sought to emphasize his compassion for those who cross the U.S. border illegally. Patrick also highlighted his opposition to abortion, which he said Hispanic voters shared. At one point he directly asked Castro to state his position on abortion rights. “If a mom comes across the border pregnant, I want her to have that child, I want her to have that Hispanic child,” Patrick said. “You believe she has a right to take that baby. I want to protect that baby, because we are born in the image of God." Castro accused Patrick of playing politics, pointing out that what he said during the debate stood in stark contrast to the state senator's tone on the campaign trail and in televised ads. Heading into the March primary, Patrick's comments referring to the influx of undocumented immigrants from Mexico as an "illegal invasion" — and his references to the diseases he said they bring with them — drew criticism from both Democrats and Republicans. “You’ve been huffing and puffing on the campaign trail like the Big Bad Wolf and now you are tiptoeing around like Little Red Riding Hood,” Castro said. The San Antonio mayor also cautioned against what he called the "radical departure" Patrick's views represented, saying they went against the "reasonable" immigration policy advanced by state leaders of both parties for two decades. "Your numbers are wrong, your policies are wrong and you're wrong for Texas," Castro said. Speaking with reporters after the event, which occurred as a result of a challenge on social media after Castro called the senator the “most anti-immigrant Republican running for office,” Patrick said he was happy he agreed to do it. "Republicans have not done a good job of coming into the living rooms of Democrats and telling them what they believe," he said. This story originally appeared in The Texas Tribune. After finishing 13 points behind Texas Sen. Dan Patrick in the Republican primary, incumbent Lt. Gov. David Dewhurst told Republican women in Arlington on Thursday he may need to introduce himself to voters again, even though he’s held statewide office for 15 years. Dan Patrick brought out some star power in Highland Park: Mike Huckabee. The former presidential candidate and Fox News host focused on Patrick’s surprising lead in the March 4 primary. A little more than a year ago, at the Democratic National Convention, a new voice arrived on the national stage. That voice belonged to Julián Castro, the mayor of San Antonio, who got the coveted prime-time convention slot that once served as a launching pad for Barack Obama and before that, Bill Clinton. Castro was re-elected in May, but his national profile has stayed high, thanks to campaign-style trips across the country. And he’s the first guest in the new KERA series “The Friday Conversation.” During a visit to the Federal Reserve in Dallas this week, he sat down with KERA’s vice president of news, Rick Holter. In Fort Worth today, Sen. Dan Patrick, a Republican candidate for lieutenant governor, again said he supports equal pay for men and women but he doesn't think government should enforce it. Patrick and incumbent Lt. 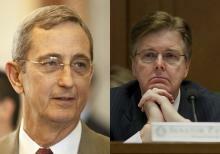 Governor Davis Dewhurst will face each other in a May 27 runoff for their party's nomination. Dewhurst, who presides over the Texas Senate, has said he would again allow an equal pay measure to be voted on if enough senators wanted that to happen. The legislature passed a bill last session allowing employees more time to file equal pay claims but Gov. Rick Perry vetoed it. State Senator and Republican Lieutenant Governor candidate Dan Patrick may have taken a political hit this week, when a story broke accusing him of employing an undocumented worker in the 1980s. The story was reported by The Dallas Morning News and KTRK Houston ABC, but the two got wind of the story when another Lt. Governor candidate, Jerry Patterson, gave them the information - which he hired a private decective to gather . It's called opposition research. And it's an age-old political tactic that often provides ammunition to candidates trying to gain the upper-hand against an opponent. His mother may not like to hear this, but Jason Stanford is an opposition researcher. "Oh God, yes, my mom tells people I'm a used car dealer," Stanford jokes.